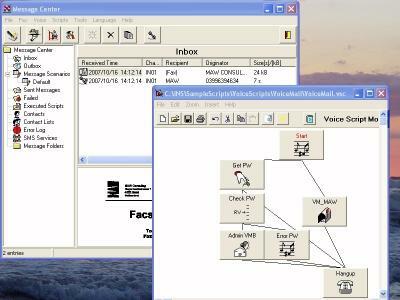 INS is a highly configurable IVR (Interactive voice response) software designed to send messages through your computer and let your computer handle incoming calls. It allows you to send messages to pagers mobile phones (SMS) fax machines as voice file or as E-mail. At the same time you can configure the application to handle all your incoming calls. Interactive Voice Response (IVR) applications for CT (Computer Telephony) where the caller uses the phone keypad to enter values can be created through the graphical work flow designer. Applications like Fax-on-demand SMS-on-demand Voice Mail and other IVR systems are possible without any programming. A simple voice modem or voice board is all you need. Voice files can be recorded or created through a text-to-speech engine. You can also design interactive scripts to dynamically react on incoming SMS or e-mail messages. Scripts like SMS-to-Email or EMail-to-SMS are only some of the possibilities.